Mazda has announced plans to launch a new CX-3 crossover. The Nissan Juke rival will get its debut at the Los Angeles Auto Show in November and should reach the UK in 2015. The CX-3 is, more specifically, a ‘compact crossover’, which means it exists to tap into the very lucrative market currently dominated by the Nissan Juke, with the Renault Captur, Ford EcoSport and Vauxhall Mokka on the fringes. The announcement is accompanied by the now obligatory swoopy design sketch ‘teaser’, above, which indicates nothing of what the production car will look like, but does appear to show a three-door model. The official CX-3 launch will be in LA on 21 November – the first press day of the Auto Show – at which point we’ll know more, but a Mazda source did tell us that the car will be in global showrooms in 2015. 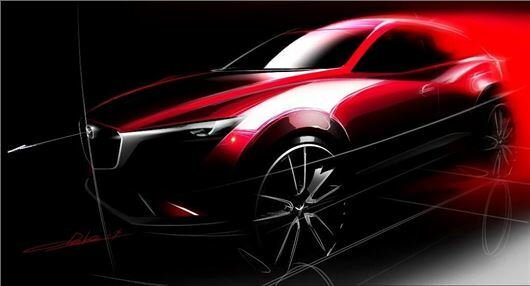 The CX-3 will debut alongside the brand new Mazda MX-5, which recently got its official launch at the 2014 Paris Motor Show. The two are likely to share Mazda’s freshly announced 1.5-litre Skyactiv petrol engine, although the lion’s share of CX-3 sales will undoubtedly be diesel – most probably a de-tuned version of the 150PS Skyactiv-D diesel that returns 68.9mpg and 107g/km in today’s Mazda 3.